What happens when Superman becomes Clark Kent and has to live among ordinary people? That’s the question at the heart of Destiny 2. Bungie say they want to tell a more human story this time around. In fact, they want to tell more story. Period. Keep an eye on our upcoming PC games list for more from the future. In the new video, Bungie describe Destiny as “foundational,” a setup for the world. It asked questions, but maybe didn’t deliver all the answers. 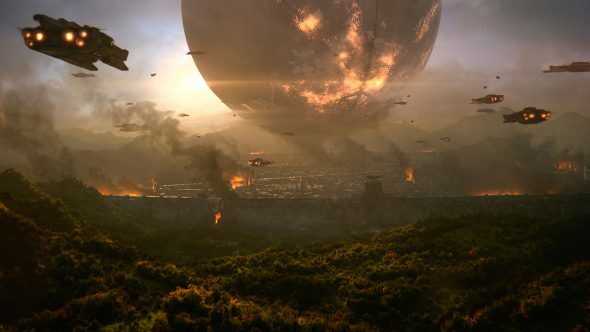 The various expansions for the first game didn’t touch upon the Traveller – the big, power-giving planetoid handing on the horizon – but Destiny 2 will be based around the Traveller and its fall. Perhaps we’ll even find out what the hell the Darkness is. Or maybe not. Essentially, Destiny did all the world-building for Bungie, and now it’s time to tell stories within it. Have you heard the one about the guy who shoots loads of aliens? At the end of the video, cinematic lead Matthew Ward jokes that he’d love it if people complained that there was too much story. Have a watch above.